The oldest form of news publication and quite frankly, a clear favourite for many even today, newspapers are read in almost every household across Sydney. And because of that, it is also common to find old newspapers stacked up in some corner of a room jut collecting dust. For a lot of people, the paper has served its purpose once read and is ready to go in the stack or be thrown away. 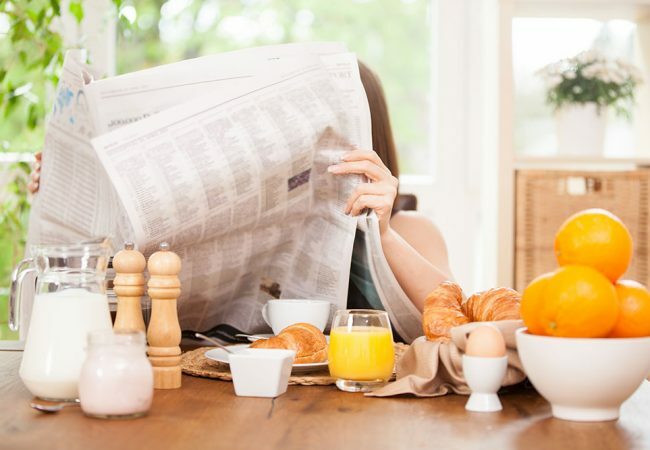 But we’re about to share 13 superb household uses for old newspapers that will keep them from piling up in your home, and definitely, make cleaning and storing more convenient and pleasant! So grab some old papers and read on! Clean Windows/Mirrors – Have you noticed how your windows or mirrors get streaks when cleaning with a cloth or squeegee? Well, do away with them and start using newspaper to clean your windows/mirrors to perfection! Just spray on the cleaner, crush up a sheet and start wiping! Clean a BBQ Grill – Wait till your grill is just warm after it’s cooled down, and then place newspaper sheets over it. Use a spray can to wet the sheets or place a soaked cloth over them and cover the grill with the lid. After about an hour, remove the paper and wipe down the grill with a scrubber or damp cloth. The food debris and grease will come off much easier thanks to those old sheets of newspaper! Wipe Up Oven/Microwave Spills – Paper towels absorb too quickly and hence, become messy and require more pieces to wipe spills in your microwave or oven. Crumpled newspaper is great for wiping up greasy spills. For hardened food bits or stains, spray a mixture of water and vinegar onto the surface and wipe with newspaper. Line Shelves – Rather than buying shelf liners from a store, simply use newspaper to line kitchen cabinets, closet shelves, dressers, pantries, and drawers. They’re easy to replace and serve the same purpose as store-bought liners. Housetrain your pets – Litter or housetraining pads can be expensive; especially when you have to purchase them frequently. Consider lining a litter box with layers of newspaper sheets. They absorb wetness and most of the odour as well while serving the same purpose as potty and pee-pee pads. Packing Fragile Objects – Newspaper can protect glassware and other fragile items just as well as bubble wrap does. When storing away Christmas decorations and breakable objects, wrap them in newspaper and use crumpled sheets to separate them or fill in empty spaces. Papier Mâché – If you’re into crafts, you probably already make use of old newspaper for various arts and crafts projects. If not, consider giving it a try with your kids. There are thousands of Papier Mâché tutorials and ideas online and all you need is newspaper, water, and glue! Boots and Bags Stuffing – You know how your bags and floppy boots get those ugly fold creases in them? Well, if you stuff newspaper in them when storing away, you can easily retain their shape. Line Vegetable Drawers – When veggies or fruits get rotten in your fridge drawer, they make a mess of it and leave a bad odour. Newspaper can solve both these problems so go ahead and line your vegetable drawer with a sheet or two! Ripen Produce – Raw tomatoes, bananas, papayas, carrots, apples, etc. can all be ripened faster by wrapping them in newspaper. Don’t refrigerate wrapped produce, however; keep them in a cool, dry place and check on them every day to avoid over ripening. Clean Kitchen Counters – Newspaper does well to clean and buff kitchen counters. You can sprinkle water on the surface and wipe with crumpled paper, or spray on a mixture of vinegar and water to clean and give the counter a new sheen! Dining Table Protection – If you have a wooden dining table, lay down sheets of newspaper under your table cloth. It offers protection from spills and stains and only requires to be changed if liquids fall on your table. Disposing of Broken Glass – When glassware breaks in the house at some point (it’s inevitable), place 3-4 layers of paper on the floor, sweep up the broken pieces and empty them onto the newspaper. Wrap them up carefully and put it in the bin. You can use more layers of newspaper for extra precautions. Simply Maid is happy to provide you with awesome household cleaning tips and guides to make your daily chores easier and more effective! We also offer excellent cleaning services for all your home cleaning needs in Sydney. Have a look at our list of services and rates and hire a cleaning with us today! BBQ Cleaning Guide – Keep Your Grill Clean and Your Barbeque Mean! Daily Habits for a Clean and Organised Work Desk! Next Post: Indoor Air Pollutants: Out with the Bad Air, In with the Good!